There’s a sense of community at the free group winter workouts each Wednesday morning. In Seattle, the work is done at Gas Works Park. 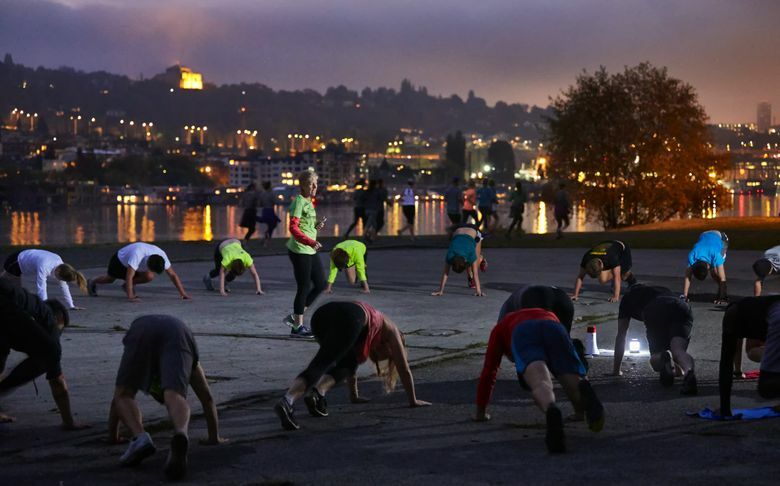 The November Project started in Boston, and its ethos to create community through free, fun outdoor workouts has spread to cities around the country, including Seattle, where a group meets Wednesdays at Gas Works. I had a few friends there, and it was cool to see 100 or so people who showed up, ready to set a personal record. Seattle November Project co-leader Casey Winkler greeted everyone with a hug. I liked the vibe, though I was wary of the water pooled at the top of Gas Works hill. Were we going to do burpees in cold puddles? 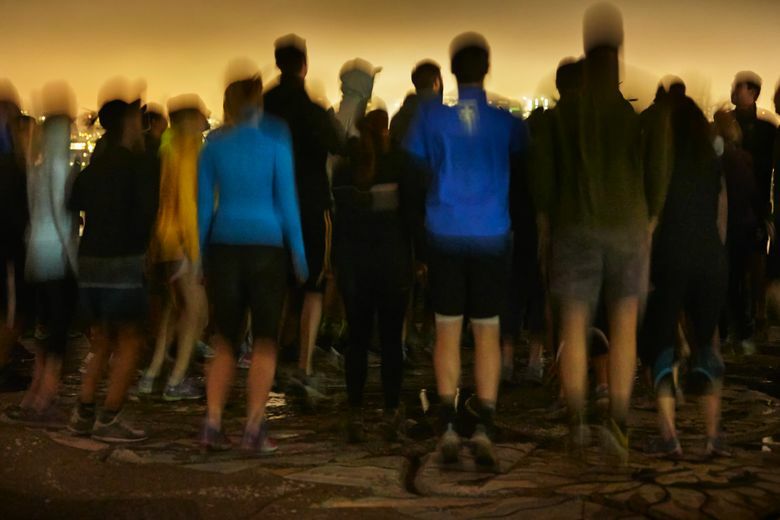 Then Winkler shared the workout — 19 laps running up and down Gas Works hill, or 3.75 miles. If you were taking it easy that day, you could do 13 laps, or 2.5 miles, instead. Running hills in the cold before 7 a.m.? It was my worst nightmare come to life. I would have preferred the burpees. We did a lap to warm up. I jogged slowly downhill on the slick pavement on the Lake Union side, was relieved to see it level out, then noted the switchbacks back up. This was not a workout for people with knee issues. I decided 13 laps was plenty. After the warmup, we were off. Many people took off down the hill. I paced myself, going for endurance rather than speed. After the second lap up, past people cheering and high-fiving us, I realized I would be lucky to make it to 13. By the third lap, I started repeating the lap number, partly to keep count and partly to give myself something to focus on. It was better than thinking about the burning sensation in my legs and lungs. Each time I rounded the bend for the uphill, I pumped my arms and forced my legs to move up the hill. Plenty of people lapped me. I ignored them. Eight, eight, eight, turned into nine, nine, nine. Every time I reached the switchbacks, panting heavily, I wondered whether I would make it to the end. On the 13th lap, a woman ran up next to me. “I’ve been keeping pace with you. Is this 12 or 13?” Oh, trust me — it was 13. We ran together. She suggested we push together on the final hill. I might not have done it otherwise. I agreed. For the last hill, she was encouraging. We can do it. I ran faster, telling myself I could make it through the ridiculous burn in my lungs and legs. We got to the top, slapped high-fives, and then I bent over, gasping for air. I looked at my tracker — 26 minutes and six seconds of hell. Then I turned around and cheered people on with everyone else. The people doing 19 laps were pushing through; one guy who finished jumped in to accompany the final runner on her last lap. I was impressed. Once I caught my breath, Winkler smiled and said he told me it was PR day. Most workouts are a more accessible combination of body-weight and cardio exercises. Also, one friend, an endurance athlete, didn’t seem to find our hill workout nearly as crazy as I did, so there’s that. And, I would go back. I loved the encouraging community. I loved starting my day active. It was fun. It’s free. Give it a whirl, but maybe check whether it’s PR day.